We’re hiring! Click HERE for more information! 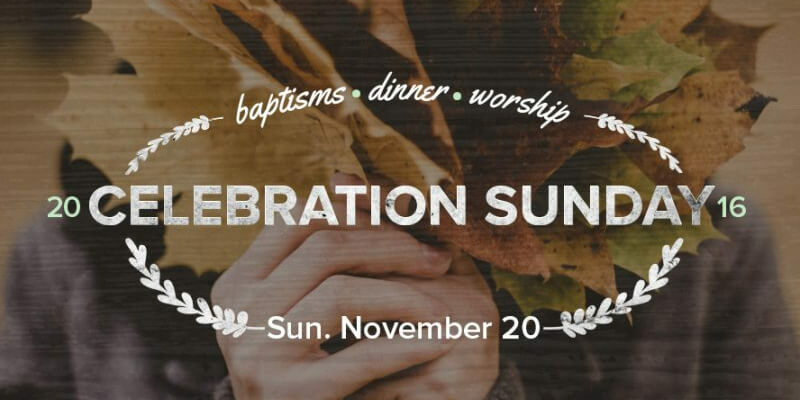 Join us for Celebration Sunday November 20th – 5 PM Dinner & 6:30 PM Service. There will be a ReStored update and an opportunity to give. God is doing remarkable things in and through the lives of those in our church family, and we think that’s something to celebrate. So save the date and join us for Celebration Sunday! We’re going to share a meal, worship God, and cheer on members of our family as they publicly commit to following Jesus through baptism. We believe that baptism is an important step of obedience for every person who has accepted Christ as his or her Savior. If you have decided to give your life to Jesus and follow him, we want to encourage you to take that next step as a public declaration of your faith. Contact one of our staff pastors if you would like to join others in being baptized during the Celebration Sunday service.